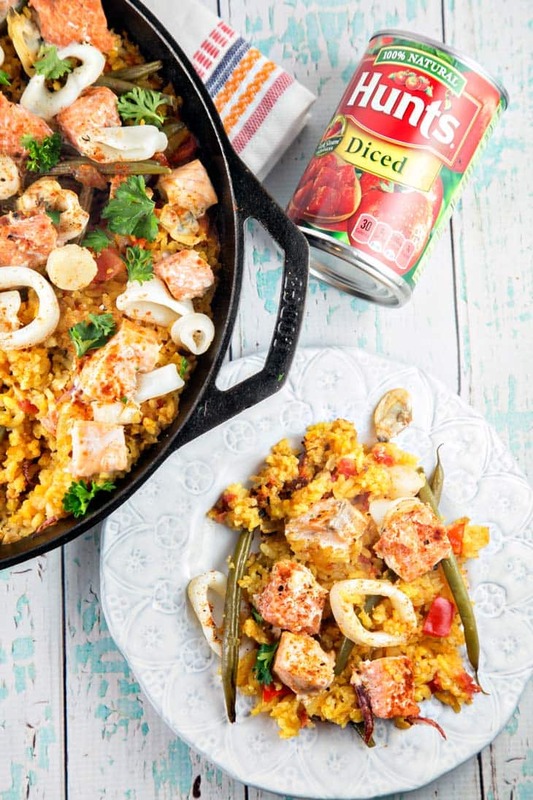 Easy, one pan salmon paella is a great way to change up your salmon game. Made with easy-to-find ingredients, this is a great heart-healthy dinner option. First, let’s clear the air here. This is not traditional, authentic paella. I have had amazing, authentic paella in Spain. I have cooked even more amazing, authentic paella with Iron Chef Jose Garces in his kitchen at Volver. I still can’t believe I haven’t blogged about that experience – it was one in a million. Standing side by side with Chef Garces, getting paella tips and chatting about how his kids won’t eat their vegetables. Now that was legit paella. This salmon paella is delicious, but in a different way. It’s easy. It’s made with ingredients that you can find. There’s no need to import any specialty ingredients. You don’t need a top notch fish monger to provide you with the freshest shellfish. This is weeknight, all easy to find ingredient, paella. But did I mention it’s still delicious? It’s also a heart-healthy dinner option. Today’s the first day of February, which coincidentally is American Heart Month. Did you know that heart disease is the number one cause of death in the United States for both men and women? Yikes! Heart disease is near and dear to me personally – I, like 10% of the female population, suffer from polycystic ovarian syndrome. In addition to a host of other potential concerns, like infertility, diabetes, and hypertension, women with PCOS have an increased risk of developing heart disease. If you’re also at risk, what can you do? Most importantly, talk to your doctor! Make sure you get enough exercise (you can find me at the gym most days after work) and eat a heart-healthy diet. We stick to healthy dinners around here, especially because we want to raise our toddler with a healthy relationship with food (note that little hand, grabbing a raw pepper while I was photographing this!). This salmon paella is a great choice: the American Heart Association recommends that we eat fatty fish like salmon at least twice a week. Now, back to our salmon paella! I don’t own a paella pan, so I make mine in a cast iron pan. Any wide pan will work – we want a lot of surface area for the rice. We’ll start with sofrito, the flavor base that is part of all paellas It’s just some chopped vegetables cooked in oil. I like to use garlic and onions for this. Some people add tomatoes and peppers; I prefer to toast the rice first and then add the rest of the vegetables. Once the onions and garlic are nice and dark, we’ll add the rice. Let it cook for just a few minutes to absorb the remaining oil, then add in tomaotes and peppers, some spices, and the broth. Then, you don’t touch it. Wrap everything tightly with aluminum foil and step away. This is NOT risotto – don’t stir. Put down that spoon and walk away. Go wash some dishes or check your email or play with your kids. Nope, you still can’t touch it. After 20 minutes, add your seafood. You can use whatever you like here. I like salmon, both because it’s so good for you and because we can easily find wild salmon, which is a better option than typical farm raised fish. I also add some frozen shellfish and squid, but if you don’t eat these, leave them out. Sure, fresh clams and mussels in the shell are a much “prettier” dish, but like I said above – not everyone has access to great fresh seafood. Add the seafood and a little more broth, cover the pan back up, and wait another 15 minutes. We’re still not going to stir the rice. The bottom layer will get nice and crispy and create a crust, called socarrat, which is my personal favorite part of the paella. 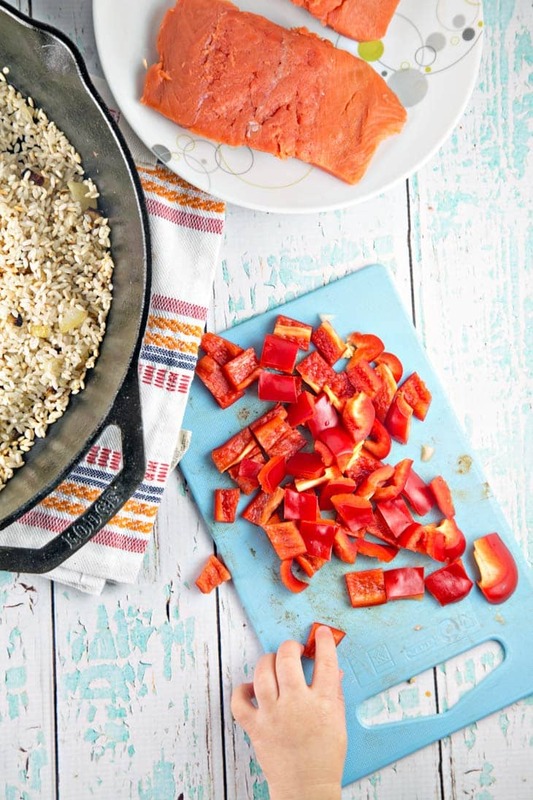 This heart-healthy one pot salmon paella is a favorite around here – even my toddler loves it. (“More salmon! More geen beans! More pay-ya, Mama!”) And since it’s healthy, I’m happy to let him have seconds. Or thirds. Or fourths, as the case may be. 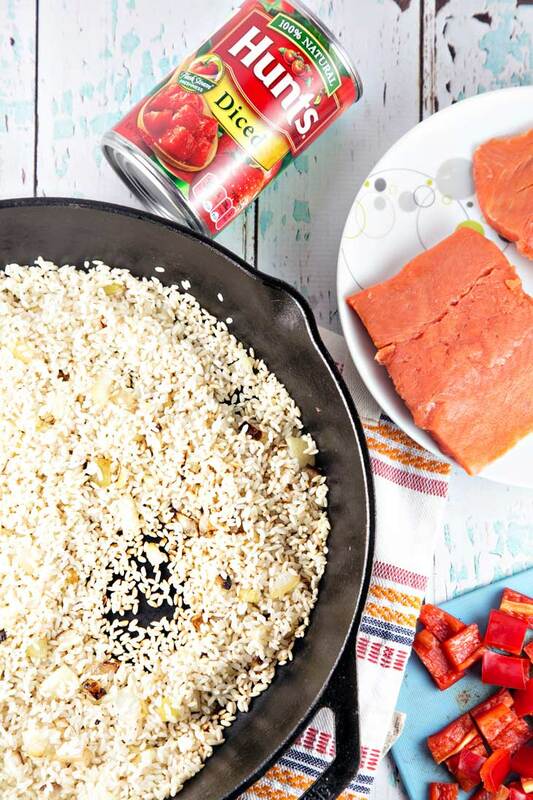 Easy, one pan salmon paella is a heart-healthy dinner option made with easy-to-find ingredients. Heat the olive oil in a large cast iron skillet or other wide, flat pan over medium-high heat. Add the onions and sautee until translucent, about 5 minutes. Add the garlic and stir for another 5 minutes, until onions are starting to darken. Add in the rice and toast in the pan for 2-3 minutes. Add the Hunt’s diced tomatoes and juices from the can into the pan, along with the red pepper and green beans. Stir to combine. Add the saffron threads (if using), 1 tablespoon of the smoked paprika, turmeric, red pepper flakes, and salt. Give a few final stirs to combine the spices. Pour in 2 cups of water and bring the liquid to a boil. Allow the water to boil for 2 minutes, then reduce to low heat and cover the pan tightly with aluminum foil. Cook for 20 minutes without touching. While the paella cooks, sprinkle the remaining smoked paprika over the salmon and add salt and pepper to taste. After 20 minutes, carefully remove the foil. Spread the salmon and shellfish over the rice. Pour an additional 1/4 cup of water over the rice, recover the pan, and cook for an additional 12 – 15 minutes until salmon is cooked through and flakes with a fork. Garnish with chopped parsley and enjoy hot. It is such a great way to make salmon that is a little different than typical baking on a pan. We love it and I hope you guys do, too! I love that you used a big cast iron pan for this.. I almost bought a paella pan last year when I saw one at Aldi for $10. But the longer I stared at it’s massiveness.. the more I could NOT justify the cabinet space that monstrous thing would take up. I’d have to make paella every week for that to be worth it in my teeny kitchen haha! I’ll have to try the cast iron idea! Thanks! You’re making this non seafood person want to eat seafood! I’ve actually never made paella. 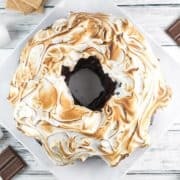 This looks pretty interesting but then I love anything made in one pan. Think I could get into something like this soon! I’m such a fan of Hunts! I buy Hunts brand all the time. 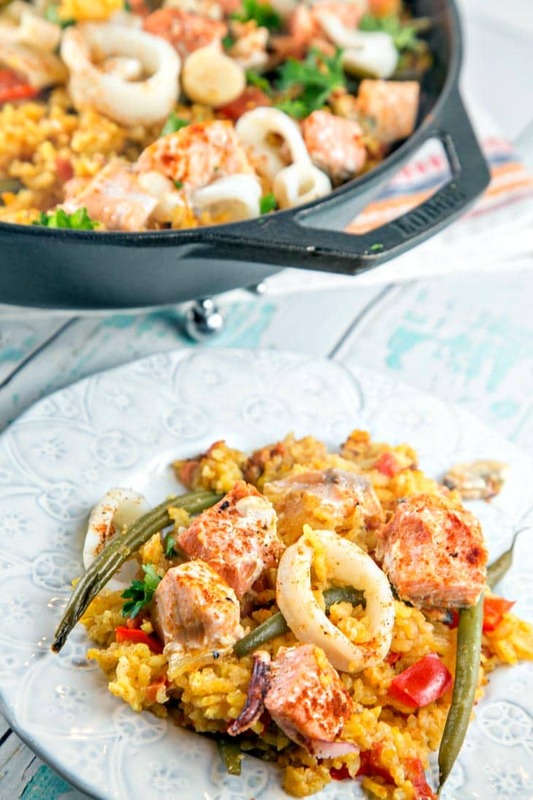 I love the idea of a salmon paella – looks divine! I could make this for dinner tonight. All I would need is the salmon. 🙂 By the way, have you tried the Hunts Fire-Roasted Tomatoes? To die for! I just made paella last week for a cookbook club I’m in and it turned out really well. But it had clams, scallops, and mussels in it which my husband doesn’t care for. I was so glad to see this recipe using salmon which he does like and will definitely be making this version soon! Thanks so much for sharing! I absolutely love a good one pan meal! I keep saying I am going to try paella! Your recipe looks like a good colorful place to start!! What I love most about this dish, is the flavorful rice! I know my salmon loving husband and daughter would be thrilled if I cooked this for them, but I may also try subbing chicken for the seafood (I just can’t make myself like fish no matter how hard I try!) and keeping everything else the same. Your photos are wonderful! It looks delicious and since I’m a big fan of wild-caught salmon, I would love having this dish one evening. The only problem is we do have a large cast iron skillet — at home. We won’t be home for another two months. Will pin this for making later. I’m so glad you’ve mentioned heart health in this post Julie. Most people don’t understand how important is healthy diet and healthy lifestyle to prevent diseases like hypertension, diabetes and heart problems. We need more heart friendly, easy and delicious recipes like this one 😉 Sharing and pinning this! Heart healthy diets are SO important. I always try to stress that just because my blog mainly focuses on baking doesn’t mean that I eat lots of sweets all the time! Desserts are meant to be shared for special occasions, but daily eating is what really matters. Lean proteins, lots of veggies – all so important! 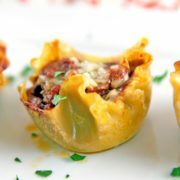 You made me totally hungry right now and I am craving this for dinner! We love Salmon and Paella so I am adding this to my must-try list. YUM!!! I love paella but have never thought to make it with salmon. Sounds delicious! Our children love salmon so I will keep this recipe in mind. We happen to love Paella. I will admit I have never made it with salmon. Sounds totally delicious. I have some salmon in the freezer, and this just might be where I need to use it. 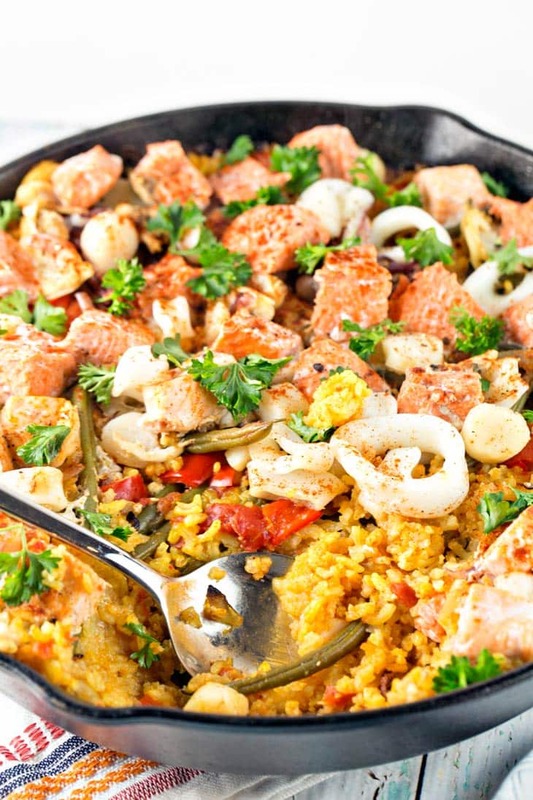 I love the idea of salmon paella! Nice to have another option for salmon that just baking or grilling it!! Yes, we like salmon, but grilled or baked can get a little boring after a while. 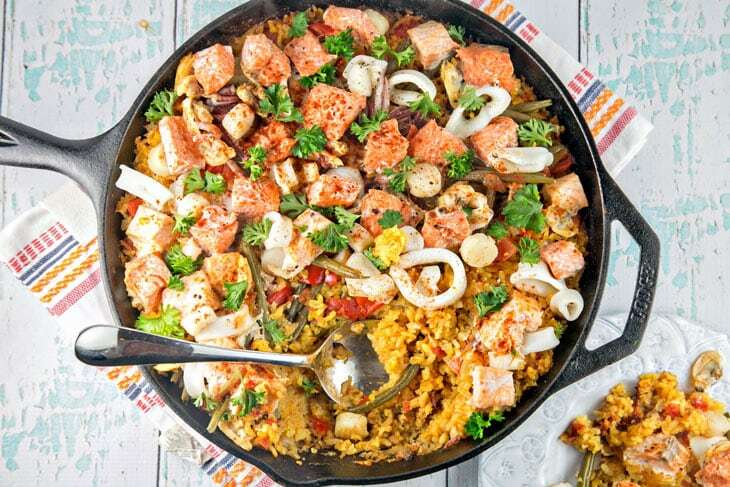 Paella is such a great way to mix it up and still get healthy salmon into your diet! What broth?! Article talks about it but recipe and instructions only talk about water. Whoops – I’ve made it with both broth and water, and I guess I used the terms interchangeably here, too. I’ll go back and update the post now; thanks for finding that error, Bob. We aren’t fans of salmon in this house but we are of paella! I would easily swap the salmon with shrimp and this would be right up our alley! Shrmip paella sounds amaaaaazing. My husband is allergic to shrimp, so sadly it’s never something I cook, but it would be so good in this! 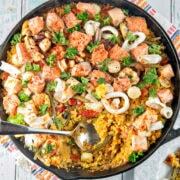 I haven’t made paella with salmon, looks like great option to make sea food paella with salmon. Love that you added red bell pepper, this one is complete meal I can eat any time. I love the convenience of the canned tomatoes and Hunt’s is absolutely my first and only choice. It gives such a beautiful color to the Indian curries that I make. Love making one pot meals and your pictures are gorgeous! Thank you, Sandhya! I love fresh tomatoes from the farmer’s market in summer, but we only have two to three months a year when we can get them locally. The rest of the year, I always buy Hunt’s! You got to cook with Jose Garces?! My mind is blown, and I am jealous! This paella sounds and looks fantastic, yum! It was such an absolutely incredible experience. We’ve been fortunate to cook with some other big food names, many of whom are a little pompous and condescending (as you might expect), but Chef Garces was just so nice and down to earth. It was so much fun! Paella is one of those super impressive, and super delicious meals! I love that it’s all in one pan – means more time for socializing! One pan/pot meals are my go to now that I’ve started working full time again. For a while there I made super elaborate meals almost every weeknight, but it’s not so easy to maintain anymore. p.s. loving your cast iron skillet in these photos! Need to invest in one of those next ? One pan meals are SO important when you work!! I’ve been really into sheet pan dinners right now – I can prep everything in the morning before I leave and my husband puts them in the oven when I leave work, so we can eat as soon as I walk in the door. It’s the only way we survive since I tend to get home pretty late! I love that you use one pan! I love paella and this looks scrumptious! I’m all for heart healthy! 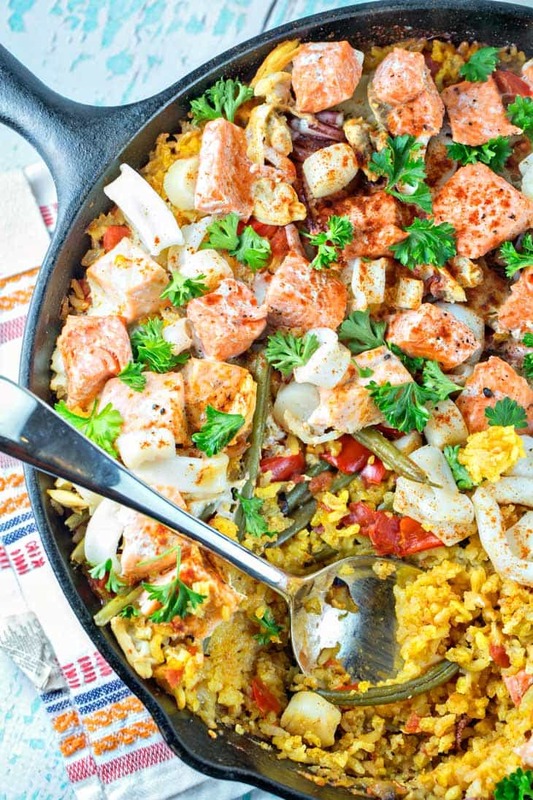 I’ve never put salmon in paella, but your recipe makes me want to. I’ve never made paella but this looks so delicious! I’d love to try it. I’m a big fan of salmon. Yum! My wife isn’t huge on seafood, but even she said this looks good! I’ll have to give it a shot and add it to my meal plan! This is a beautiful dish! Would be great for Valentine’s Dinner this week.